Deserts, grasslands, mountains and tropical coastlines all combine to form China. 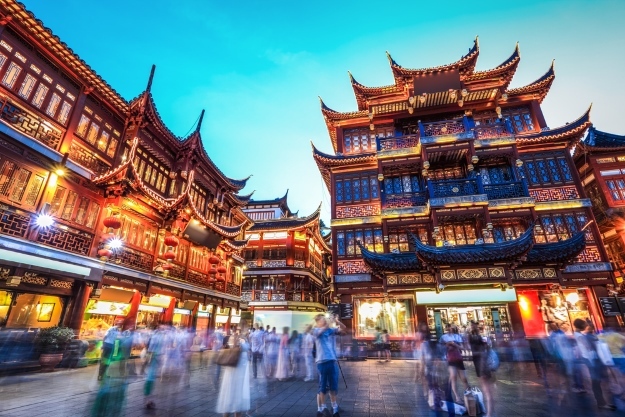 As the fourth largest country in the world, China’s sweeping landscape harbours some of the world’s most extreme climates, as well as truly inspiring natural wonders. In this article, we reveal 10 fascinating facts about China’s landscape to show you just how diverse the country is. The soaring sandstone peaks of Zhangjiajie National Forest Park (pictured above) were used as inspiration for The Hallelujah Mountains in 2009 blockbuster Avatar. Remarkably, this otherworldly landscape was declared China’s first ever national forest park in 1982. 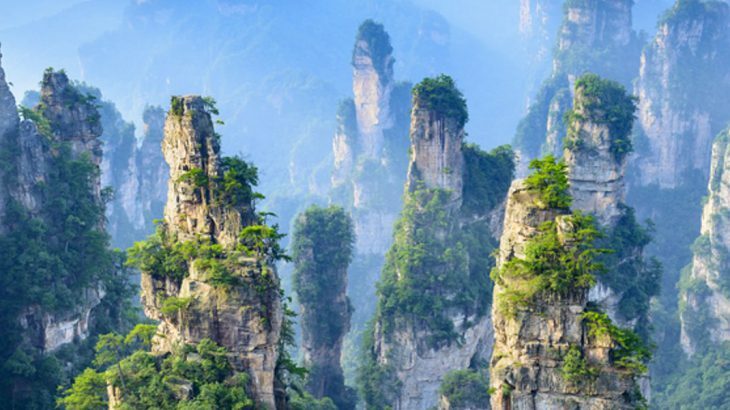 With some 3,000 towering pillars, each hundreds of feet tall and covered in a lush green foliage, Zhangjiajie National Forest Park was recognised as a UNESCO World Heritage Site in 1992. Unusually, in honour of the highest-grossing film of all time, the name of the pillar which inspired the makers of Avatar was changed to ‘Avatar Hallelujah Mountain’. This was part of a drive to bring more tourists to the park. If you’ve dreamed of visiting these majestic stone columns, you can do so on a tour of China. It’s difficult to imagine that less than 30 minutes from the bustling metropolis of Hong Kong lies a relatively untouched coastline. 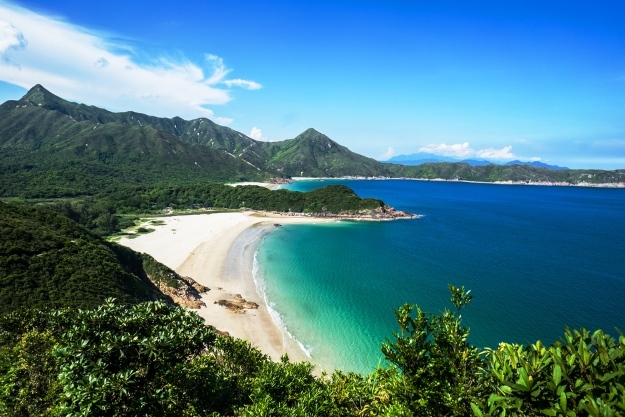 Pristine white sand beaches, lush forest-lined mountains and beautifully blue water can be found in southern China, including the largest of Hong Kong’s islands – Lantau Island. Marie Pottiez of travel and lifestyle blog Miles of Happiness, lives on the beautiful Lantau Island with her family. Who better to ask about the joys of visiting this magical place? “After a year of living in the vibrant district of Wan Chai, we decided to move on to a quieter place,” said Marie. “We discovered Lantau Island, and it was love at first sight. It’s been 3 years since we moved to the island and we wouldn’t change it for the world. There’s a fantastic lifestyle here. As a trip to Lantau Island and Cheung Sha Beach is part of our Hong Kong in Focus tour, we were curious to find out if Marie had any tips for visitors: “There are two sides to Cheung Sha Beach,” said Marie. “On weekends and public holidays, it gets an awesome festive vibe with live concerts, skimboard and surf sessions at sunset and cool restaurants. 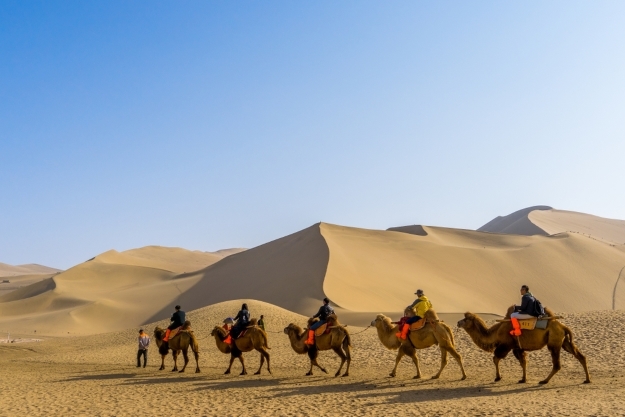 Covering parts of northern and north-western China, the Gobi Desert is the fifth largest desert in the world. It measures more than 1,000 miles from southwest to northeast and 500 miles from north to south. Although there are spectacular sandy peaks, the majority of the Gobi Desert is exposed rock. Unusually, the Gobi is a very cold desert, seeing frost and occasionally a dusting of snow on its dunes. It also sees an average of 7.6 inches of rain annually, although this is increased in the winter when snow is blown in by wind from the Siberian Steppes. Such severe winds can cause the temperature in the Gobi to reach -40 degrees. Its harsh climate sees the temperature change by up to 35 degrees, not within a season, but within 24 hours, making it one of the world’s most extreme landscapes. Although much of the desert is in China, it also stretches into southern Mongolia. The name ‘Gobi’ derives from Mongolian, meaning ‘waterless place’. Fun fact: Some of the world’s first fossilised dinosaur egg discoveries were made in the Gobi Desert. 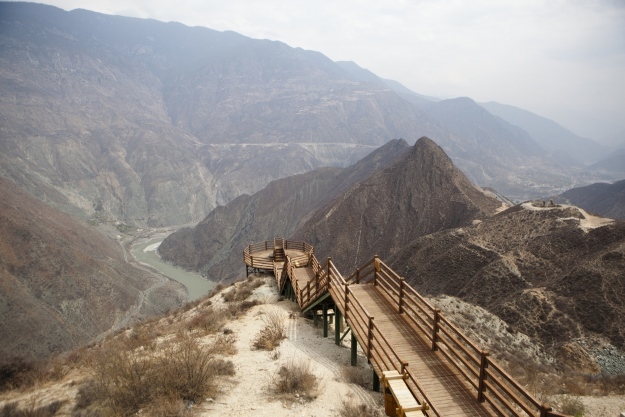 Spanning 3,950 miles, the Yangtze River is the longest in Asia, and the third longest in the world. This impressive river is also the longest in the world to flow entirely within one country. 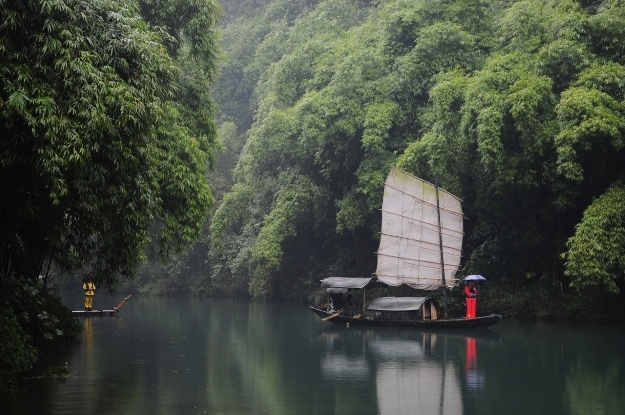 For many years, the Yangtze has played a large role in China’s history, culture and economy. It contributes greatly to the country’s wealth and is home to many endemic species, including the Yangtze River dolphin and Chinese paddlefish. This beautiful river cuts through towering gorges and dense forests, and originates from tributaries in the eastern part of the Tibetan Plateau. In recent years, two dams have been built: the Three Gorges Dam and the Gezhouba Dam. The Three Gorges Dam is a hydroelectric gravity dam the largest power station in the world in terms of installed capacity, and its construction proved somewhat controversial. You can see the impressive dam and experience life on the Yangtze River first hand on your China holiday. Giant pandas are native to south central China, and this remains the only natural habitat for this adorable creature. Easily identifiable by the black patches around their eyes, ears and body, these fluffy animals might be cute, but they’ve also been in dire need of help. Many giant pandas still live in a few mountain ranges of central China, mainly in Sichuan, however as a result of extensive farming and deforestation, the loveable giant pandas have been forced out of their natural home. Fortunately, organisations such as Chengdu Giant Panda Breeding Center have stepped in to help. Home to roughly 50 pandas, the centre specialises in panda breeding, with a baby panda house and health stations. As a giant panda’s diet is 99% bamboo, there’s tonnes of the stuff growing within the grounds to keep them well-fed. If you’re eager to get acquainted with these cuddly creatures, we offer tours incorporating a trip to Chengdu Panda Center and Duijangyan Panda Base. Alpine pastures and lush meadows form part of China’s grasslands, covering 41% of the nation’s land area. Due to the great ecological variety, the use of grassland isn’t limited to grazing for farm animals or foraging, it is also used to harvest forest by-products and mineral resources. 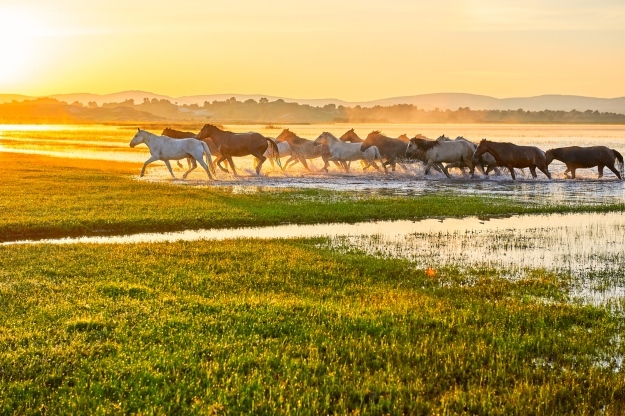 Due to China’s sheer size, its proportion of grasslands is the second largest in the world. The Hulunbuir Grassland in the Inner Mongolian region covers roughly 250,000 square kilometres – the same size as the UK. Home to roughly 1.3 billion people, China has the highest population in the world. Its population density is so great, that more than 100 cities in China are home to over 1 million people. To put that into perspective, the total UK population is currently just 65 million. The futuristic city of Shanghai is estimated to be the biggest city in the world by population at roughly 24 million, followed closely by Guangzhou. On your holiday to China, you’ll get the chance to experience Shanghai. Its glistening skyscrapers and prime position on the Yangtze River make it a truly fascinating place to visit. And although its contemporary façade is hard to ignore, if you dig a little deep you’ll discover some of the city’s hidden treasures, including the historic alleys of Old Shanghai. The towering peak of Mount Everest isn’t the only star of the show in China; a third of the country is made up of mountains. With more than 35 mountain ranges found in all corners of the land, China has many famous peaks. Jade Dragon Snow Mountain, a small range in the Yunnan Province of southwest China, soars 5,596 metres high. Lush forests and meadows can be found here, blooming with wild peonies and orchids. In Leshan, Mount Emei is a UNECO World Cultural and Natural Heritage Site reaching 3,077 metres above sea level, and is accessible to visitors interested in learning about its deep-rooted Buddhist culture. China has the most number of neighbours touching its border at 16 (if you include Macau and Hong Kong). India, Pakistan, Afghanistan, Tajikistan, Kyrgyzstan, Kazakhstan, Mongolia, Russia, North Korea, Vietnam, Laos, Myanmar, Bhutan and Nepal all border this great country. 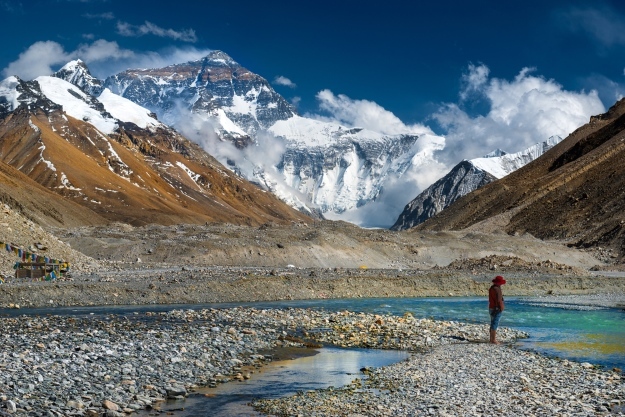 One of China’s most famous landmarks, Mount Everest, is shared with Nepal. Sharing a border with so many nations has its quirks. 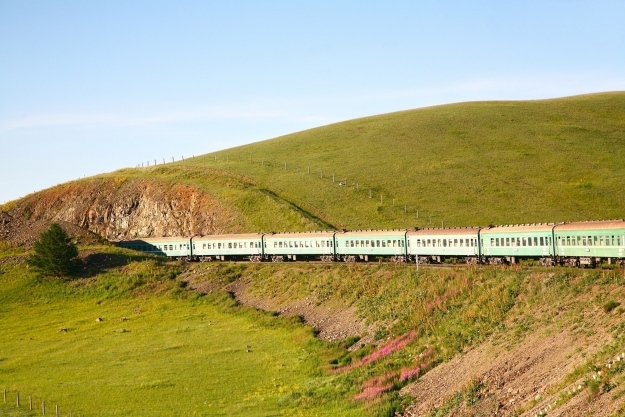 Trains crossing between Mongolia and China need to have their wheels changed at the town of Erlian, because railway tracks in China are narrower than in Mongolia. The border between China and North Korea is one of the world’s most heavily-guarded. Home to the world’s highest peak of Mount Everest at 8,848 metres and the peaceful Ayding Lake, which sits 154 metres below sea level, China has the greatest altitude difference on Earth. In fact, the country is full of fascinating highs and lows. Zhangjiajie Grand Canyon has the world’s highest and longest glass bridge running across the canyon for 430 metres, at 300 hundred metres in the air. And Yarlung Tsangpo Canyon in Tibet is the deepest and second-longest canyon in the world, stretching 300 miles between the Himalayan summits and reaching an incredible 5,800 metres at its deepest point. If you want to experience the diversity of China’s landscapes, why not join one of our escorted tours? Choose from our many itineraries to discover this fascinating country for yourself. Book an escorted tour to China with the UK’s leading Asia Experts, Wendy Wu Tours. Alternatively, work with our tailormade team to create your dream China itinerary. Whichever you choose, we can guarantee you an unforgettable trip!